Anno is about building an empire, starting with just a handful of coins in your pocket and a few buildings in your newly founded settlement. It is a long road with many challenges to overcome but with skillful management, you will soon grow your city into an impressive metropolis. Seasoned Anno players might already know this of course, but efficient logistics is the key to a successful economy. 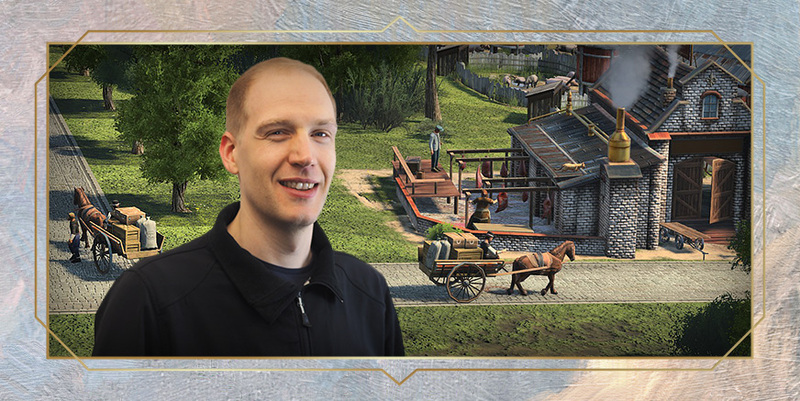 Today, our Senior Game Designer Christian opens his ledgers and gives you an exclusive look at the logistics system in Anno 1800, including interesting insights for both experienced economists and new players taking their first steps into the world of Anno alike. Hi my name is Christian and I am Game Designer for Anno 1800. I joined the team for the production of Anno 2070 and have since then worked on all following Anno titles. My job is to work on the core economical parts of Anno 1800 and I am excited to give you a little glimpse into our logistics system! If you break it down to a very basic level, logistics is the system of transportation of goods. In Anno, it is a complex system of interacting cogs in a wheel, powering your economy in order to build, maintain, and expand your city. Whether you are the min-maxing perfectionist or a beauty builder who wants to create the most picturesque cities, meeting your citizens’ ever-increasing demands for goods and resources is at the very heart of the Anno gameplay formula. Of course, many of our players want to go beyond simply meeting those demands and instead take pride in perfecting their logistics to build massive empires with huge production lines and dozens of trade routes. That just shows what a massive and complex topic logistics is in an Anno game, so we will focus on the transportation of goods on your main island for today’s DevBlog. Of course, trade routes will play an important role in Anno 1800 as well, but we will save that topic for another day. In the last Anno game, the position of the goods on the map or their distance to the next production building was largely irrelevant. This will drastically change with Anno 1800, as physical goods celebrate their comeback to the series, and in doing so bumping up the complexity of gameplay that many of you have asked for. To make that possible, the game needs to be able to measure the distance to a building and other targets, while taking the current location of the goods into account. This is once again all visually represented in the game world, allowing you to follow your wares’ cart journey from production to warehouse; this helps to immerse players in the world, but also to make logistics easier to grasp through visualization. And of course, it really adds to that crowded and lively feeling that you expect from a flourishing Anno city! In order to optimize your economy, you have to keep a keen eye on your production chain to ensure that all goods find their way through your thoughtfully created street layout. We all know that this can be a rather demanding task; building a complex production chain, ensuring that all goods find their destination and identifying blockers when there is a sudden shortcoming of resources. To explain some of these concepts better, let us look at a typical production chain in Anno 1800: steel production. Our newly built smelter is ready for production but in order to fuel our steel industry, we need to ensure that it gets a steady supply of coal and iron ore. Luckily, a charcoal burner is close by and cart pushers ensure that the coal finds its way directly to the smelter. If the smelter is sufficiently stocked with coal, or if there is a general overhead production of coal, it will instead direct the goods to the warehouse for storage (unless there is some other immediate demand for it in the vicinity). This is where horse-drawn carriages come into play. While it is the job of a cart pusher to deliver resources from one production building to another, the carriages loads up excess production to bring it to a warehouse for storage. As mentioned before, our logistics system checks the shortest way between a supplier and your production buildings. The basic rule for efficient delivery is that – in order to reduce bottlenecks – emptying your storage has the highest priority. In our given example, the charcoal burner detects that there is a demand for coal nearby and sends a cart pusher to the smelter instead to the nearest warehouse. The game will also decide if it sends out goods before the cart is fully loaded to fulfill demands or if it would be more efficient to wait until it has loaded more before sending the delivery. So what are these decisions based on? Deliveries are prioritized by the necessary travel distance on streets. To help with planning, you can see a building’s “reach” on the map. Upgrading your streets from a muddy path to proper cobblestone will increase speed, which furthermore means that a production building might be capable of reaching facilities in corners that may have been too far away to reach previously. Our goal is to give you more options when designing your city, from optimized street layouts to the decisions on where to put your manufacturing districts. We added a new layer to the warehouse itself, which now has a loading and delivery bay. As more transporters try to access the warehouse, it will get crowded outside, which can lead to a delay of the loading process. When too many carriages try to store resources and goods in the same warehouse, you will be able to see how they queue up in front of the loading bay. However, don’t worry about traffic jams on your streets, as this will only affect the warehouse gates. Transporters also check the nearby warehouses and might prioritize a warehouse with less traffic, if it would result in an overall shorter delivery time. This will all be represented in the warehouse menu, where you can see detailed information about delivery and loading processes, as well as the actual goods in storage. As your progress through the game, you will also be able to upgrade your warehouse to increase the number of loading bays, allowing more carts to be serviced, simultaneously. Depots will further increase the islands storage limit but will not have an effect on loading and delivery. These will come in handy when you expand your empire and establish trade routes. Warehouses themselves share one island bound storage, where all stored resources on your island will be accessible from any of your warehouses. This is still an experimental new feature we are working on, but we are so far quite happy with it and hope the additional visual feedback not only makes it easier to understand, but also adds some additional entertainment. With Anno 1800, we want to create a complex logistics system while enhancing the visibility and readability. Added options will be a welcome addition for Anno veterans while making it stays comprehensible even for new players. What’s the deal with trains? We also know that there is one specific topic where you are thirsty for details: the trains, relentless steel horses of the industrial revolution. The train feature is not 100% set in stone yet, and we are currently evaluating some possible design scenarios for how trains could work in Anno 1800. We have many ideas on how we could implement trains into the game and we want trains to reflect the advancement of the industrial age. Trains presented a reliable new way to transport tons of goods over long distances, overcoming one of the major hurdles that threatened the progress of the industrial revolution. It is a complex topic and of course, we want feedback from you, the Anno Union. With this logistics DevBlog, it was also our intention to explain some of our underlying systems in order to give you the knowledge to give feedback on potential train gameplay designs. We are looking forward to reading your comments and are curious to see what you think of the logistics in Anno 1800. Honestly you should just scrap the water, the islands will be habitable/fertile lands (kinda like islands still) then make the trade routes trains (instead of boats accross water), and have advanced land units (1800’s have line infantry and cavalry, maybe cannons too) the trains would be the best trade routes anyways, maybe make the land inbetween the islands infertile/desolate land) only used for infantry to fight on and trains to be built for trade routes! I think this would be amazing! Cavalry could even invade/raid other train routes! Hey, i am pretty late for a comment i guess but well. I can tell you that the train, or in generall the steam enginge, is the most important part for the IR setting. Mining, Transport even Livestyle changed in the era of steam. So Trains are a key element and have to be there. Also the research for this is just extremely interesting and diverse. I could point out a new game that was released just a couple of days ago that has so much historical accurate research in it, that i was stunned. Never too late for a comment! Thanks! Trains were important to transport employees to factories in the 19th century. This was long before the mass use of cars. You will have to model a factory it’s need for personnel thought, it should not just help the factory but also the employee. Trains would be most useful if you give players a reason to build factories and residential zones far apart. Another use of trains was bulk transportation of goods, like iron and coal from mines to factories, if you make the mass/volume of those too great for pulling cars then would you encourage the use of trains. I´m so glad you are working on another ANNO! I really loved ANNO 1404 and I really look forward to the new one. Logistics are always awesome to tackle, I really loved making trade routes and protecing them from pirates. I´m excited to see all the new ships that you´ll implement and their developement – from sailboats to steam ships. Ships in the sizes of Titanic should be considered as monuments – like the great Cathedrals were. I´m also excited to see trains. I´d suggest making resources rare and far away so you wouldn´t often encounter iron and coal next to each other. Imagine having to deliver coal from one side of the map and iron from the other and establising an industrial center in between. While horses would make the process very slow and trains would make it faster. Or you could change warehouses for cargo train stations. Meaning that warehouses on one island could be connected by rails and you would build trains through a train workshop to operate them. I´d also like to see more politics in the game – not only how satisfied are your citizens with their needs and taxes, but also what kind of a ruler they want – something like Tropico 5. We must remember that this era was very important for its shift from absolutism to constitutional monarchies and republics. You should also implement waste disposal – imagine those great slag heaps dominating the mined wasteland! I was born in an industrail city that has its roots in the industrial revolution. Do some resarch on how it affects the scenery and the environment. Also, a very important thing for industry is water. You can´t have heavy industry without rivers. And finally take a look on how real mines look like. They are not simple houses on top of a hole with resources. I´d love to see you guys create something more detailed an realistic. I like idea how seriously you are taking logistics. Details like you described will make Anno 1800 feel more lively than any other Annos so far! I can’t wait seeing how train system will work! The goods system in Anno 2205 was also fine, it suited the future times and the focus on multisession gameplay but it wouldn’t make sense in 19th century. One thing important to me is that carts should be getting to an entrance of the warehouse and not to the side of it where there is just a wall. That’s more about visuals but such details are crucial for me. I know it’s still pre-alpha so I hope you will work on it in the future. Trains seem to be hard to implement with what you said here about logistics system. The only idea I have is that with trains you could quickly transport goods between factories which are far away from each other while one of them requires some goods which are produced in the other one. That would save some cart pushers for smaller production areas where trains would be too expensive to be used for such a short distances. The other idea, which would require big changes in current logistics system, is that you need trains to transport goods between different warehouses on the island so that all goods are really available everywhere. That would need getting rid of the idea of having all goods available in every warehouse right away after delivery from the factory to only one of the warehouses. Note: This idea would work only when you have to transport goods between warehouses! I really like that you are going back to the physical goods, similar to older games such as Anno 1404. I have just one question: Will you always need a road connection? Or do some parts also work without road connection? For example, in Anno 2070 upgraded warehouses and depots had a flying unit which could pick up goods (for example fish from off-shore fishery huts) without a road connection. Will we see something similar in Anno 1800? I would like to be able to connect the islands by railway bridges. Build a large rail network between the islands in one session. The railway bridge should not be tied to a place (as it was with bridges in Anno 2205) I would like to build a railway bridge where I find it necessary. I’d like to see a few trains running all over this network. I would like to be able to upgrade the train. Increase the speed, increase the amount of cargo carried, add more wagons, etc. The scale of one session and the islands on it is very impressive with huge distances. The railway network will grow to new islands. Over time, it will be a large and complex network with many trains. Some could move inside the island or between two islands. Others move very far across many islands to the other end of the map and back. Send a train from one session to another? I think this is not a good idea. What if they are separated by the ocean? Then only sea routes are available. Very excited and hope that even just the framework for trains and railroads makes it into release. If not, at least the framework and something that could be built upon in an expansion or DLC or future Anno title. Trains are so appropriate for this era and a game with a heart in its logistics system! – No island-wide shared storage, but rather large AoE or Harbor-zone style for warehouse, and inter-ware house connections and late-game railways can offer efficient transport on larger home islands. – Make railways and trains really change the late game, as suggested like the 2205 “production and module modifiers”. Industry stations/sidings can offer huge efficiency gains similar to tier-ed production system, extensions that add extra production or input goods storage, or loading efficiency modifier for warehouses or depots. Alternatively for a more simpler implementation, railways could be used to access map assets that spawn out of build-able area, for example a high-alpine timber camp, a valley quarry, or an inner farmland accessible via tunnel or over bridge. I know in an earlier diary it was said that mine tunnels would be unlimited resources, but perhaps ‘late game’ accessible areas via rail-link only are the unlimited resources and the sustainability mechanism for unlimited raw goods for the production chain. – I really liked the example of multi-session or off-map game play with railroads and AI trains. Tie it into the world exposition idea or similar. My only concern with this is it becomes a luxury mechanic and not one that a player can optimize or Exchange goods between production areas, which is the large fun of “plan-forget-revisit-optimize” shipping trade routes. – Have different tiers of goods, and “goods Mk2” are only accessible via trains. For example, basic steel rods (equivalent to 1 unit of steel) is different than for example pallet-loads of steel (equivalent to 20 units of steel, for example). A delivery cart could carry between 1-5 steel rods, freight train could carry 4-8 cars of steel palettes. Railroads are required for this late game ‘at scale’ industrialization. Thanks for great development diaries and asking for feedback from the community of Anno players. Getting rid of shared storage is the literal last thing in the entire game I’d want them to change. I’d even rather 2205 mechanics over losing that. Quantum storage has always been how its worked and that’s perfectly fine. If Trains can’t fit into that then get rid of Trains. How would I make Trains special? Making a track from the harbor on the left side of an island to the right doesn’t seem exciting. Making a long bridge connecting islands doesn’t seem realistic and would also negate the need for ships. What I’m thinking is we’ve got carts for island transport and ships between islands. Therefore the theme of the idea would be to make the Trains the end game construction project that connects the multisessions. But don’t make the mechanic anything resembling a spaceport. -Train track (multisession) distances have a linear relationship with transportation time between roundtrip sessions. – Trains have an operating cost in the form of burning coal and consuming water. -Train stations are a predefined location on an island adjacent to the map edge (similar to the predefined geothermal vent or sector project). -Train engines and train cars need to be manually built and configured by the player in addition to selecting the route. Multisession Trains have the potential to be a Anno 1800 metagame/endgame all by themselves. Or does this ambition risk being too far from the anno spirit? When I first saw trains in the promotional videos, my first thought was that the game could have a more continental flavour. So in addition to ship born trade you could have trains carrying goods between settlements on the same island. They could be separated by sea inlets or mountain ranges with a limited number of passes. The initial connections could be by road, but with trains you could drive tunnels through the mountains. Just like the Alpine passes and tunnels between Italy and Switzerland and Austria. So far so good. The basic logistic system sounds very familiar to a veteran Anno player. I think the horses carriages waiting at the loading bays is a nice touch to show bottlenecks. Will the warehouses need to be on street corners to accommodate the additional bays for upgrades? Trains could transport goods between island warehouses, instead of warehouses having a shared storage. Just an idea that may be too late to implement. I would love to see trains used to transport goods between different players/computers. In general there’s a lack of options for co-operation in games, especially in the RTS and city building genre. It would be really cool if you were able to implement something to improve co-operation between players – even if it would be through something completely different than trains. I agree with you. Multi-player was nice in the previous Anno games. But unless you where actually playing co-op (sharing a faction together) there weren’t much options to co-operate. And not just between players but also with the AI. But I don’t think trains are the way to go to realize this. First of all congratulations in your new game and also for not loosing the essence of the series. Even the futuristic series has been really good games I think this one brings back “the magic” of the series. First of all I see all the approaches interesting, the comeback of carts and horses as the walkers and carts it’s interesting and welcome.